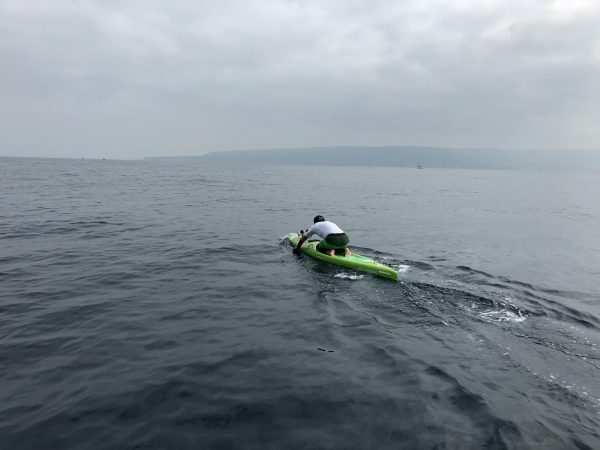 Conditions were a bit rough at the start of the Catalina Classic Paddleboard Raceon Sunday, Aug. 26, but eventually the water smoothed out, enabling Laguna local David Skarman to finish the race in seven hours and 17 minutes, beating last year’s time, in choppy water, by 36 minutes. 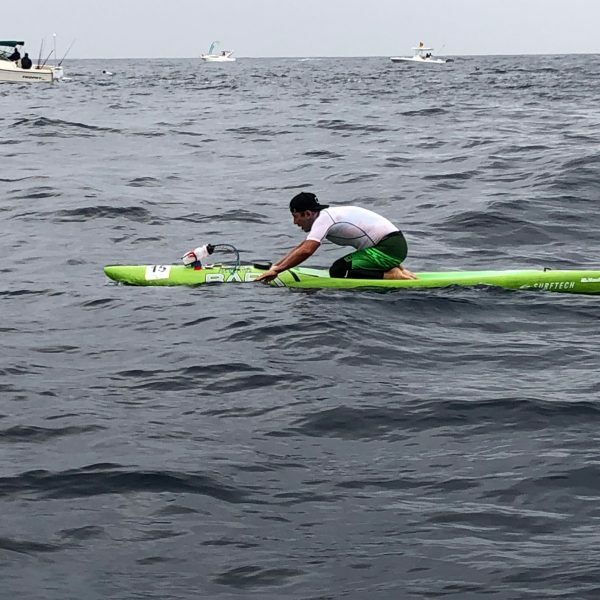 : Laguna local David Skarman competed in the Catalina Classic Paddleboard Race on Aug. 26. The Catalina Classic is touted as the most historic paddleboard race in the world by the Catalina classic Paddleboard Race organization. The first paddleboard event took place in 1932 when well-known surfer and inventor, Tom Blake, set out to promote his newly patented, hollow paddleboards as rescue devices for lifeguards. When three Santa Monica lifeguards, recruited by Blake, successfully paddled the boards from Palos Verdes Peninsula to Catalina Island, they made news and the boards were declared “up to the task.” Lifeguards used the hollow boards through the early 1950s. From 1955 to 1960, the Manhattan Beach Chamber of commerce sponsored paddleboard races from Catalina Island to their pier to promote the beach community. But not until 1982 was the race re-started and officially named the Catalina Classic 32 Mile Paddleboard Race. This year’s race was the 40th. After winning the race in 1989 and 1990 and placing fourth in 1991, Skarman, an Emerald Bay reserve fire captain, retired from racing and returned to his first love, surfing. But last year after turning 55, he was determined to try the race again with the goal of raising some money for the Mauli Ola Foundation,a local non-profit that teaches kids with cystic fibrosis to surf. “He nurtured our passion for the ocean and ocean activities,” James Dunlop, co-founder and president of Mauli Ola, said of Skarman, who was the surf team coach at Laguna Beach High School in 1987 and 1988.This year, Skarmanwas able to double the $3,500 contribution he made to Mauli Ola last year. Skarman finished the Aug. 26 paddleboard race in seven hours and 17 minutes. At the end of months of intensive training in 2017, Skarman qualified for one of the 15 open spots, on his first attempt, by completing the Jay Race, from Capitola Beach to the Santa Cruz pier, named for Jay Moriarity, the subject of the documentary film, “Chasing Mavericks.” Last year’s finish time qualified him for this year’s race. Unlike stand-up paddle boarders who use long poles equipped with short blades from yard-wide surfaces, Skarman uses only his hands while prone or on his knees to push his stock racing board, a 2017 Bark Commander, through the water.Stock boards are12 feet and 20 pounds. Boards in the unlimited division can have variances such as foot-controlled rudders and tillers on boards of different sizes. The winner of this year’s race, Lachie Lansdown, 22, of Australia, competed for the first time in the unlimited division. He has won using a stock board for the last three years. Lansdown, unable to take his board home, passed it to Skarman who will compete with it in the unlimited division next year and is already planning to begin training in earnest for his sixth competition in October. The winners of the race do not receive prize money. “There is a significant learning curve,” Skarman said. “They can be tippy, but it’s an excellent workout for the core muscles,” he added. Noting that Newport Beach already has a paddling club, Skarman expressed his desire to start a club in Laguna.